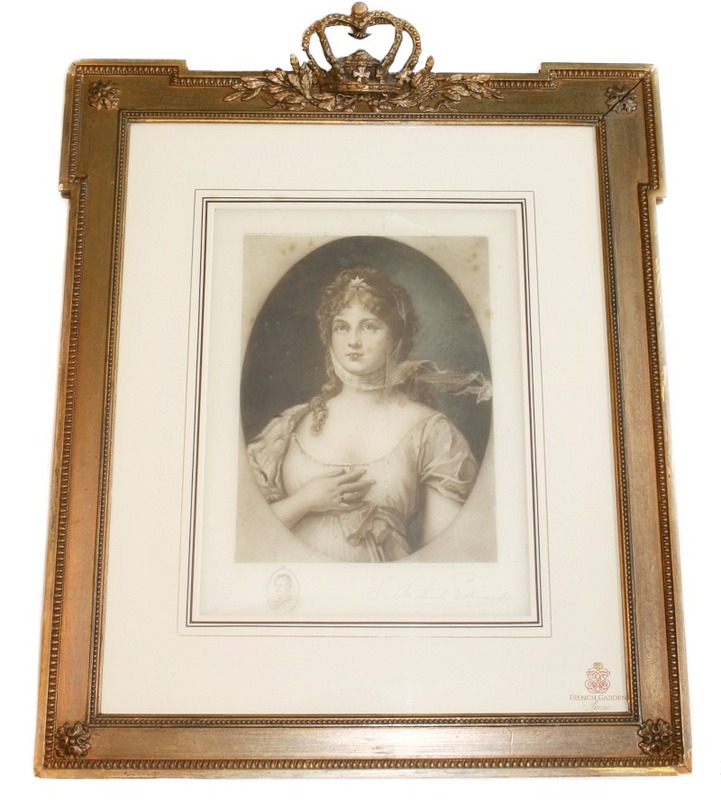 Beautifully decorative, this shabby 19th century Print of Queen Louise of Prussia is not perfect, but oh that frame! 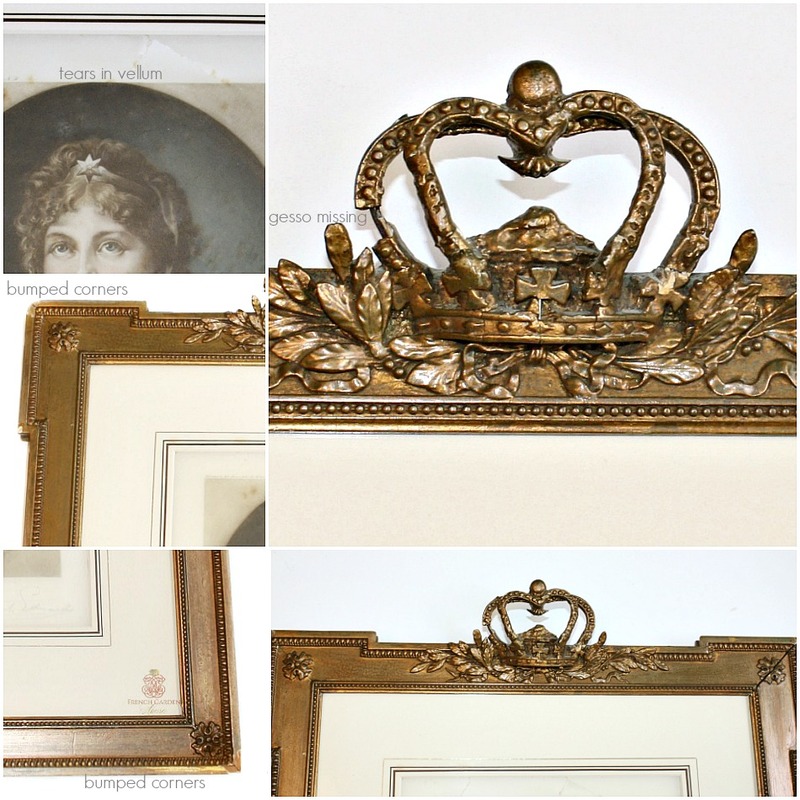 The wood frame with gilt over gesso has a top whcih features a royal crown, so rare to find. 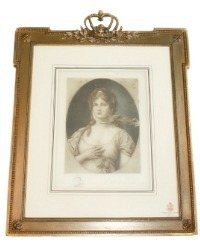 The print was mentioned in the 1893 issue of The Art Collector, a Journal Devoted to the Arts and the Crafts. Queen Louise Augusta (1776-1810) is wearing her signature scarf and royal tiara headpiece, her ermine fur cloak on one shoulder. 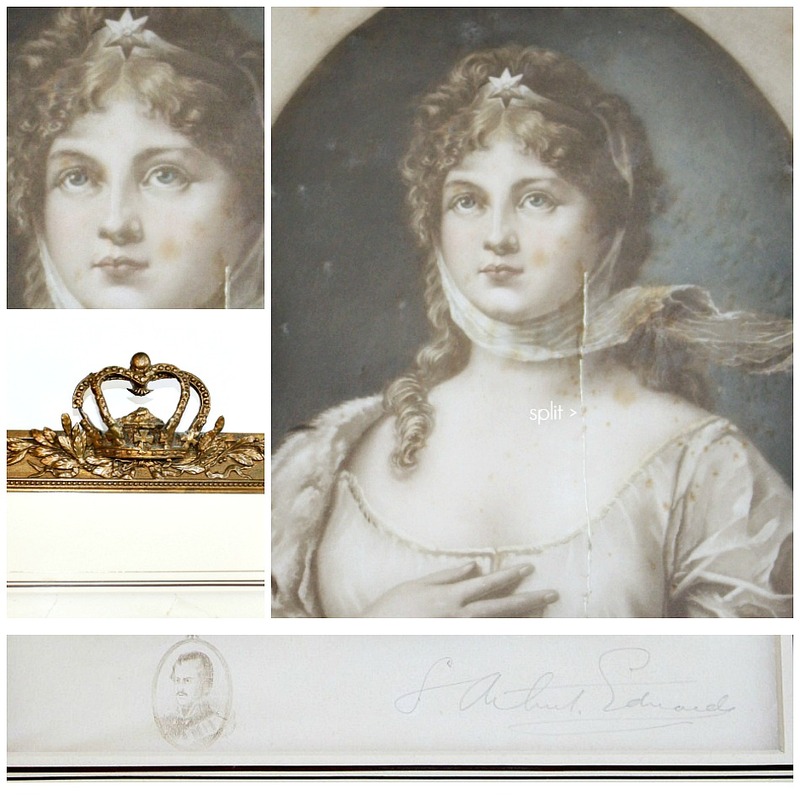 Louise has the legacy of her extraordinary 1807 meeting with Napoleon, the French Emperor, she tried unsuccessfuly to plead for favorable terms after Prussia's disastrous losses in the Napoleonic Wars. She became known as "the soul of national virtue". The print is signed in the bottom left corner, it is beautiful but not without some areas of loss. There are several parts of the vellum missing as shown, a crack in the center, there is some foxing. if you can forgive her this, she is a beauty. I have greatly upped the contrast and sharpness for you to see these. This print is after Gustav Richter, it is in a hand painted triple stripe mat. The frame is shabby alos, has loss to gesso as well, every corner is a little worn. Please enlarge the photos. Nevertheless, I fell in love with her, and hope that you will, too. Please only purchase her if you can love pieces with the grace and patina of time. Measures 21-1/2" x 16-3/4" x 3/4"